Providing animals with healthy sources of energy. Especially for young, weaning livestock it is important to ensure a high energy intake that can substitute the mother’s milk. The enzymatic activity has to change from a fat digestion towards a carbohydrate digestion. High digestibility, enhancing the animal’s appetite, the reduction of diarrhoea and a balanced and prolonged energy supply are the main factors that have to be kept in mind here. 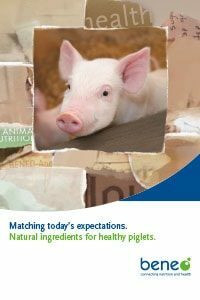 BENEO provides two unique ingredients that are fully digestible energy sources – which make them an ideal solution for young, weaning animals like piglets, for instance. BeneoCarb S is a unique low glycaemic sugar syrup, made from pure beet sugar. It has a sweet, honey-like taste and can be used to improve the organoleptical profile of animal food. The good nutritional and organoleptic profiles make our rice starches and flour an ideal source for young animals. BeneoCarb S is ideal for feeding lactating sows, veal calves and piglets. It can also be used as a source of energy for dairy cows and as a low glycaemic energy source for horses. Rice flour can be used as highly digestible energy source in the diets of young piglets.